This image was contributed by Martin Woolhead. The back reads, “Mrs. Woolhead. The unveiling of the war memorial by Canon Glossop.” It was a postcard published by Brown & Collins of 36, High Street, Bedford. Ancestry.com pins down Canon Glossop through the birth, marriage and death records. Acording to the 1861 census, he was born George Henry Pownall Glossop in 1859. The family was living in Heston, Middlesex. George’s father was a barrister and JP. George married Frances Mary Gape in St. Albans in 1886. By the 1891 census, they lived in St Albans. George was a clerk in holy orders. They had son Francis and daughters Sylvia and Gwendoline, and shared the house with 5 servants. George’s brother was there too, an infantry lieutenant. 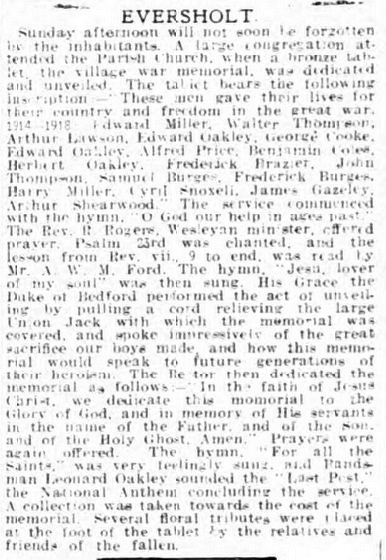 George and Mary had at least two more sons, Ernest and Bertram, lieutenants in the army in WWI, who were killed in 1915 and 1916. That must have made this ceremony particularly poignant. George died in 1925, aged 66. Canon Glossop was my great grandfather. His eldest son Francis, Frank or Billy to his friends was my grandfather. I cannot remember seeing many photographs of the canon when I was small but the family resemblance to my grandfather is very strong. So the fame of Eversholt2 spreads far and wide! Who was the chap standing on his own behind the memorial? Edit this page yourself, or send a message and hope someone else does it. It seems that the picture was taken by someone at the upstairs window of the pub! Here’s a tiny item from the Bedfordshire Times and Independent of 13 May 1921, from BritishNewspaperArchive who permit reuse. The same photographers provided the picture. Was no reporter present? The BT&I was published on Fridays, and the 13th was a Friday, so the Sunday before would have been 8 May 1921. Sunday afternoon will not soon be forgotten by the inhabitants. 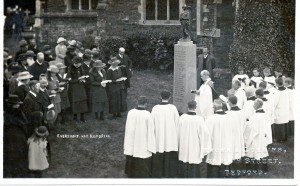 A large congregation attended the Parish Church, when a bronze tablet, the village war memorial, was dedicated and unveiled. The tablet bears the following inscription – “These men gave their lives for their country and freedom in the great war. 1914-1918 Edward Miller, Walter Thompson, Arthur Lawson, Edward Oakley, George Cooke, Edward Oakley, Alfred Price, Benjamin Cole, Herbert Oakley, Frederick Brazier, John Thompson, Samuel Burges, Frederick Burges, Harry Miller, Cyril Snoxell, James Gazeley, Arthur Shearwood.” The service commenced with the hymn, “O God our help in ages past.” The Rev. R. Rogers, Wesleyan Minister, offered prayer. Psalm 23rd was chanted, and the lesson from Rev. vii 9 to end, was read by Mr. A. W. M. Ford. The hymn, “Jesu, lover of my soul” was then sung. His Grace the Duke of Bedford performed the act of unveiling by pulling a cord relieving the large Union Jack with which the memorial was covered, and spoke impressively of the great sacrifice our boys made and how this memorial would speak to future generations of their heroism. The Rector then dedicated the memorial as follows: – “In the faith of Jesus Christ, we dedicate this memorial to the Glory of God, and in memory of His servants in the name of the Father, and of the Son, and of the Holy Ghost, Amen.” Prayers were again offered. 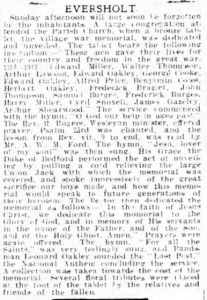 The hymn, “For all the Saints,” was very feelingly sung, and Bandsman Leonard Oakley sounded the “Last Post,” the National Anthem concluding the service. A collection was taken towards the cost of the memorial. Several floral tributes were placed at the foot of the tablet by the relatives and friends of the fallen. That doesn’t seem to be the same event as the picture above. This newspaper report comes from the Bedfordshire Times and independent, 30 July 1920. Is it the same event? It doesn’t look like the photo! Where’s the Duke? Here’s a picture of the statue on the memorial in 2011. Click for a larger version. Emrys Williams, who took this picture, places it in the public domain. 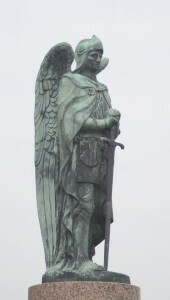 The statue on the war memorial was stolen in 2000, causing much dismay. Bedfordshire on Sunday for 27 August 2000 reports that it was stolen in July and recovered in August. It reported that an Islington antique dealer paid £450 for the statue, well below its true market value, but then recognised it from a police website of stolen property. The statue was soon back on its plinth. The Roll of Honour website describes the monument in detail. 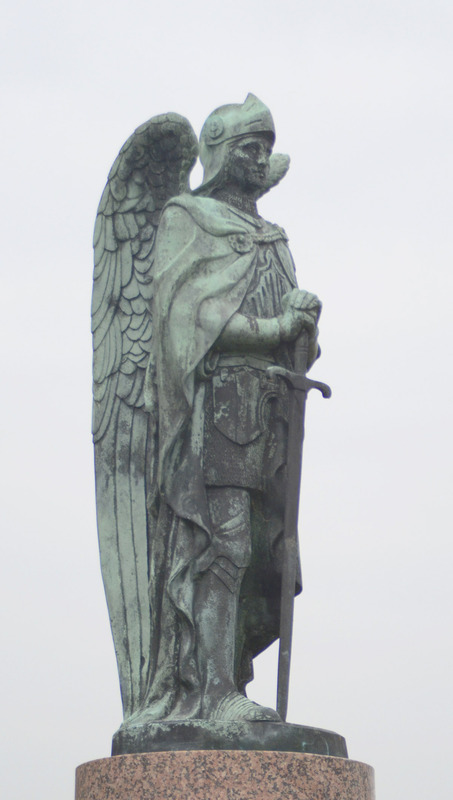 There is a lovely picture of the statue on the memorial at Flickr. The date for the service of dedication comes from The National Archives.